Out in front of the largest warehouse big box retailers in Oaxaca (you will tar and feather me if I mention the name), you can usually find a truck driver willing to carry the goods you just bought to anywhere in the city or surrounding villages — for a price. This is an essential and valuable service for someone like me who is living here without personal transportation. But, I’d never done this before and true confession is that I had a large butterfly in my stomach. 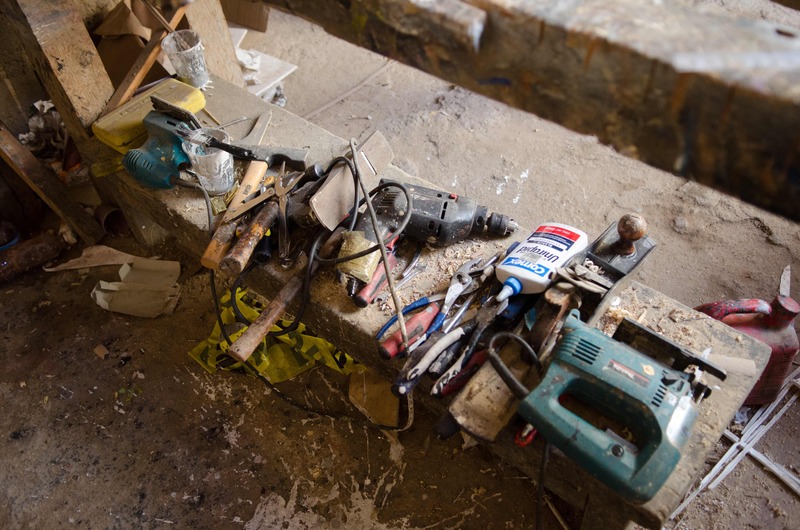 The only choice this day was a skinny, motley looking 30-something young man in need of a shave, his red baseball cap with Drink Coors emblazoned across the front tipped at a right angle. He was wearing faux leather and metal. I did not feel confident. 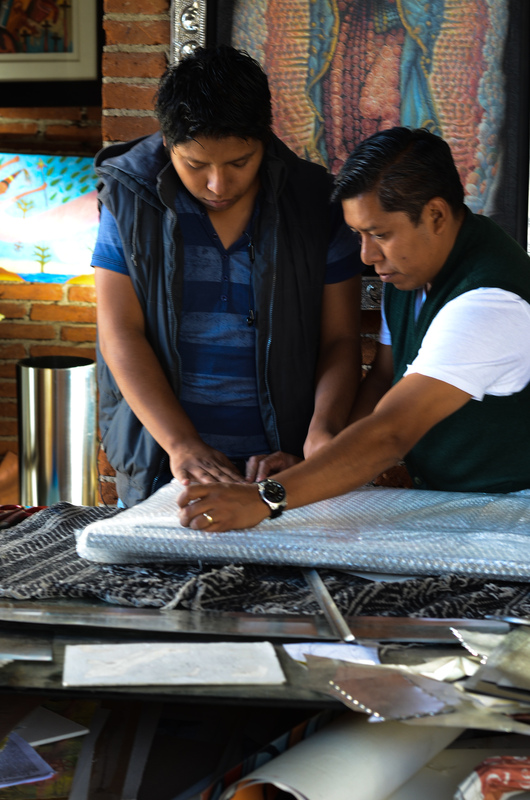 As we began negotiating the cost to bring my new bed to Teotitlan del Valle, he raised his phone to his ear to check the price with his boss. That’s when I noticed a pinky fingernail longer than a guitar pick and wondered what he used that for. His frame was thin and his belt was pulled tight around his waist, puckering the pants material. It was a January hot like an early North Carolina autumn, dry and clear. I needed to stand in the shade. We agreed on a price. Fair, I thought. Did I say I was confident? 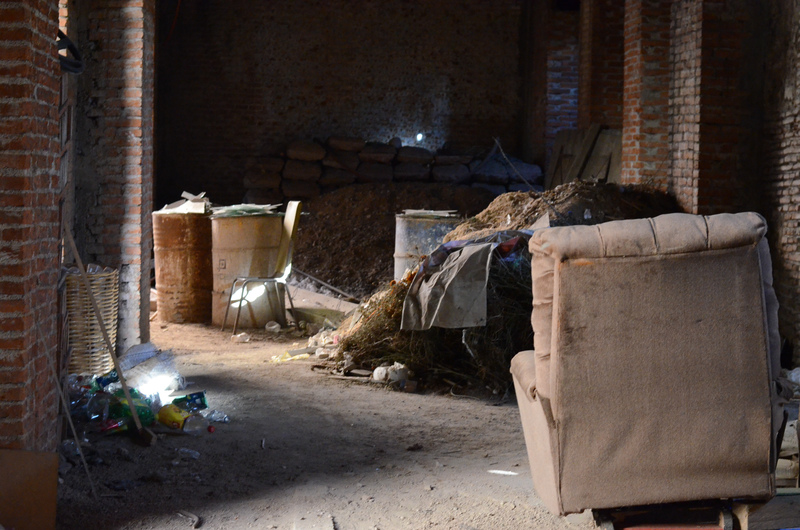 I pushed on, went in to make the bed purchase with the help of Abraham my trusty Teotiteco taxi driver, and waited the 40 minutes for it to come out of the warehouse and arrive at the front door, where the Truck Driver would take over. There, standing next to him was a robust young woman with an about three-year-old boy in tow. My wife, he introduced her. My fear melted. Then, an Ah, perhaps a ploy, I thought, headline: Woman accomplice with child decoy and long finger-nailed man kidnap naive gringa in front of the You Know What. I’m driving, she said, and climbed in behind the wheel. I joined her in the front seat of a beat-to-death Ford whose vintage I could not name. The windshield was a series of spider webs that refracted light through the pattern. Four crucifixes dangled from the rear-view mirror, one adorned with pearls, another with rose quartz beads. A decal of the chauffeur’s prayer in Spanish was stuck to the only part of the windshield that wasn’t shattered. I pulled the door closed using the half-open window. The inside panel was peeling off and by all evidence it had lost it’s handle some time ago. The child straddled the floor shift between us. He was crying and I pulled a quinciniera lollypop out of my bag. 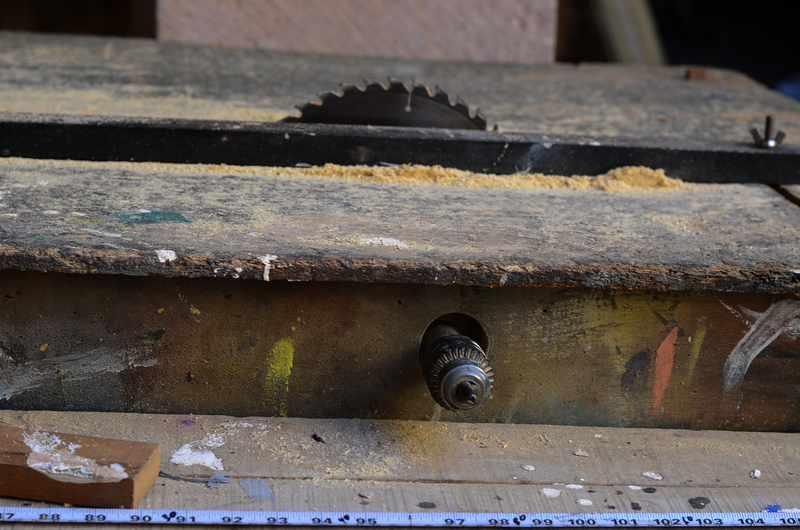 The bed went into the flatbed leaning against the modified rusting metal cage. Whew. She’s driving to me Teotitlan and I sighed deep. We backed out of the space and exited the lot. Just before we pulled out onto the highway, a boy of about 15 years old jumped onto the back of the truck holding on to the cage, leaning against the bed. In a couple of blocks we stopped for a traffic light. A motorcycle pulled up beside us and there was the husband with the long fingernail. She made a right turn and drove through a residential neighborhood of narrow streets lined with simple block-constructed houses, landing up in front of one of them, turned the engine off and got out. Adios, she said with a big smile. Gulp. In climbs husband, who proceeds to drive me to Teotitlan. I promise to go slow he said as we rocked over the series of topes (speed bumps) on the Ferrocarril road. I pulled out my knitting. Breathe, I said to myself. He talked about his father who moved to Garden Grove, California, 20 years ago, television shows that impress with images of the U.S.A. as a pastoral landscape with perfect people in perfectly clean cities driving expensive cars and living well. 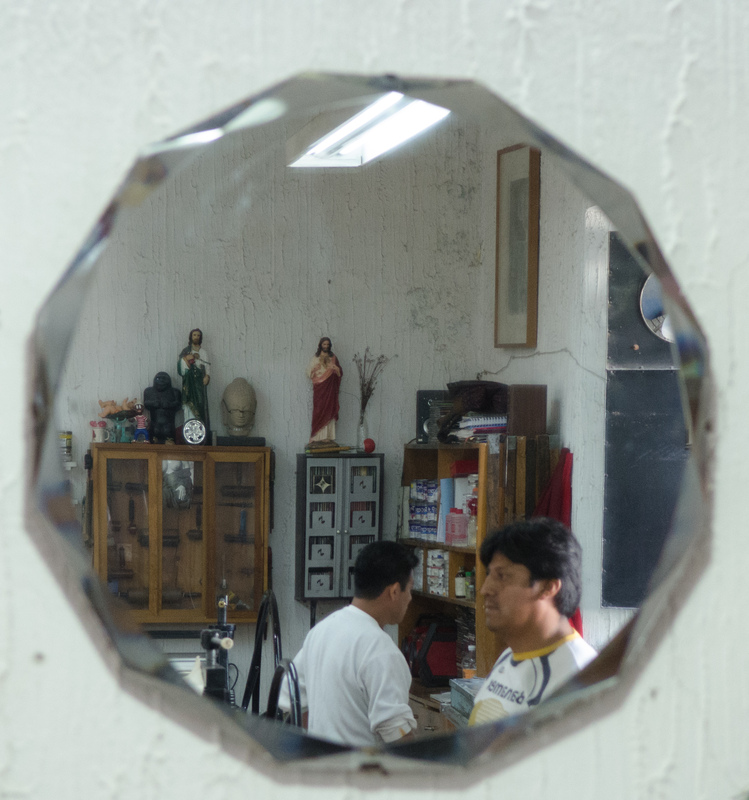 We talked about the reality of those images, immigration and lifestyle and poverty and jobs as we went from hustling Oaxaca city life into the calm of the countryside. The bed was delivered without incident, of course. He dropped me off at my favorite Teotitlan restaurant for lunch on the way back. I paid what we negotiated plus a good tip. All was well in my world. Is Oaxaca safe? Confirmation. Yes. 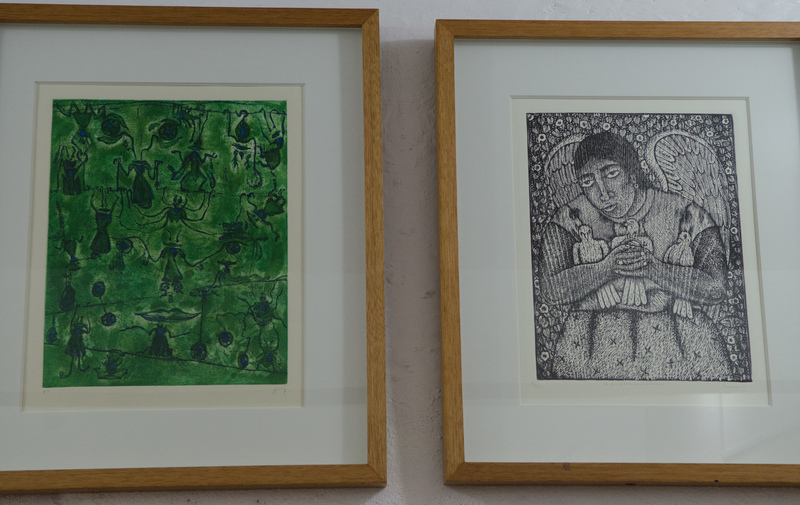 Would you like to see my etchings? A 50’s pop-cultural cliché that insinuates the seductiveness of fine art? Perhaps. 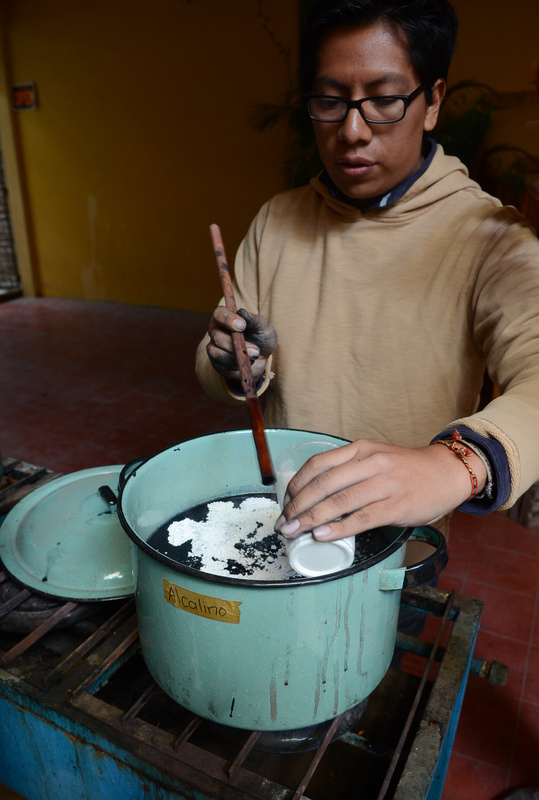 Here in Oaxaca, contemporary fine art flourishes alongside traditional indigenous folk art. 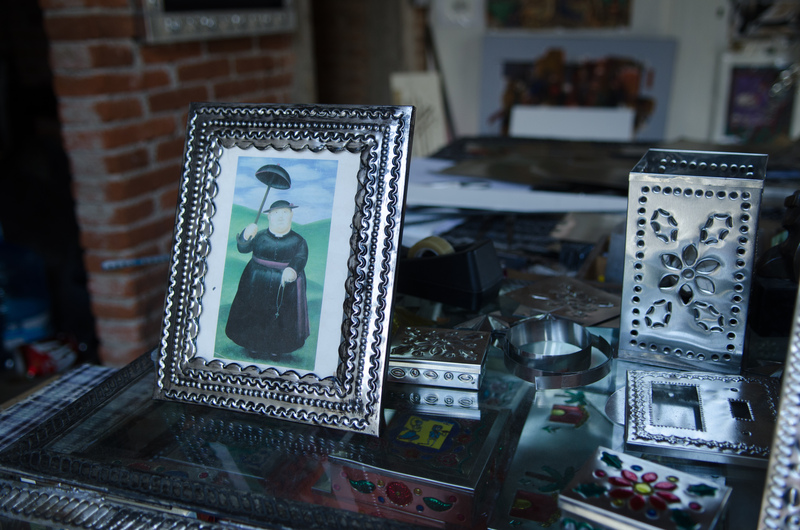 Galleries line the main avenues and offer extraordinary pieces for sale to collectors. 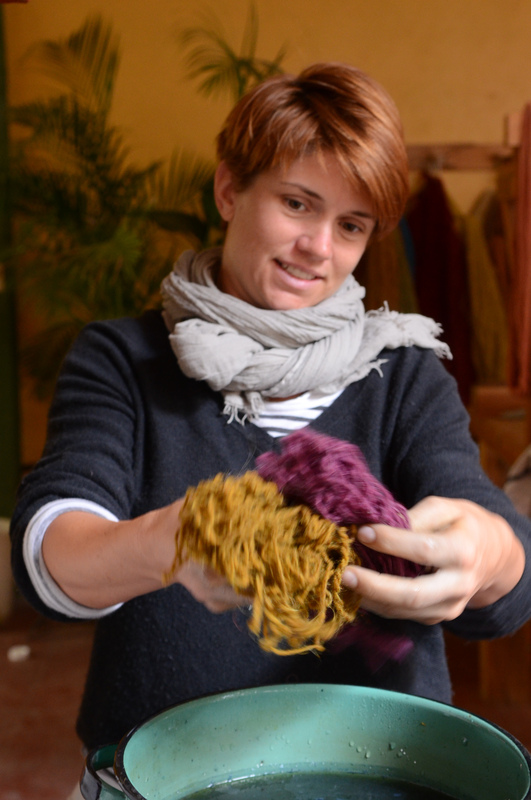 In the support of the people who make art, I share my adventure with you. 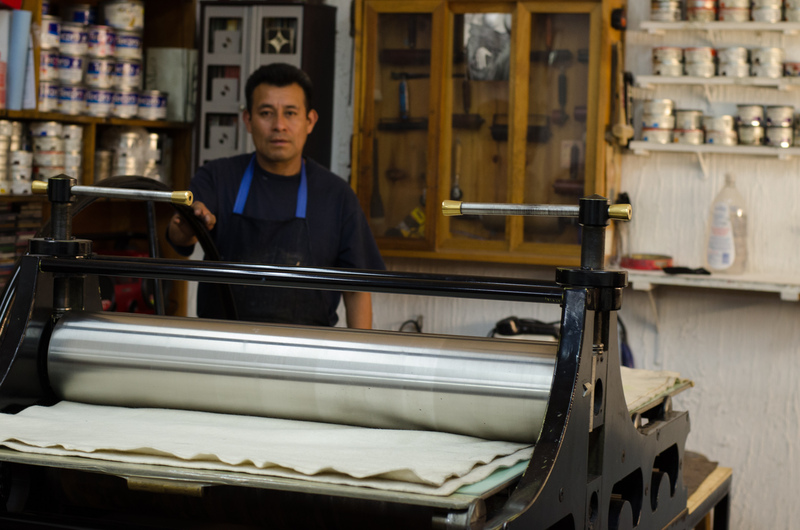 On a shady, tree-lined stretch of Avenida Hidalgo between Calles Libres and Xicotencatl, about five blocks from the Zocalo, is the Taller de Grabado. 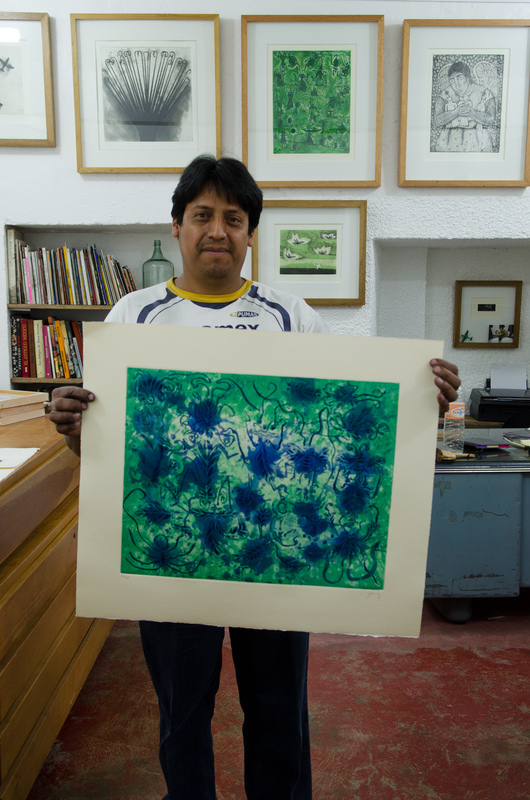 Here, working with traditional printing equipment, Jesus Antonio Sanchez and his colleagues are printing etchings onto paper. 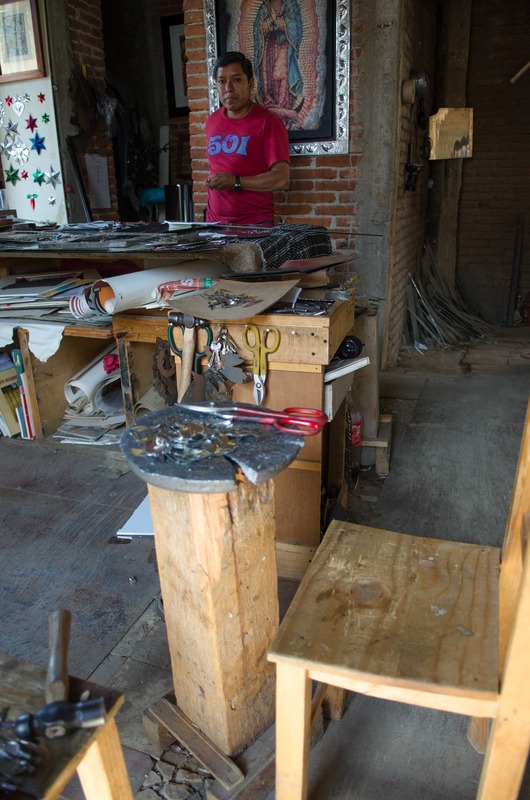 The works are created by some of Oaxaca’s most famed artists, including studio owner artist Fernando Sandoval G.
I discovered this studio quite by serendipity. My destination was the Zocalo and I decided to take a different route. Setting out from Calle Libres near Murguia, I walked one block further to Hidalgo rather than making my usual right turn onto Independencia. 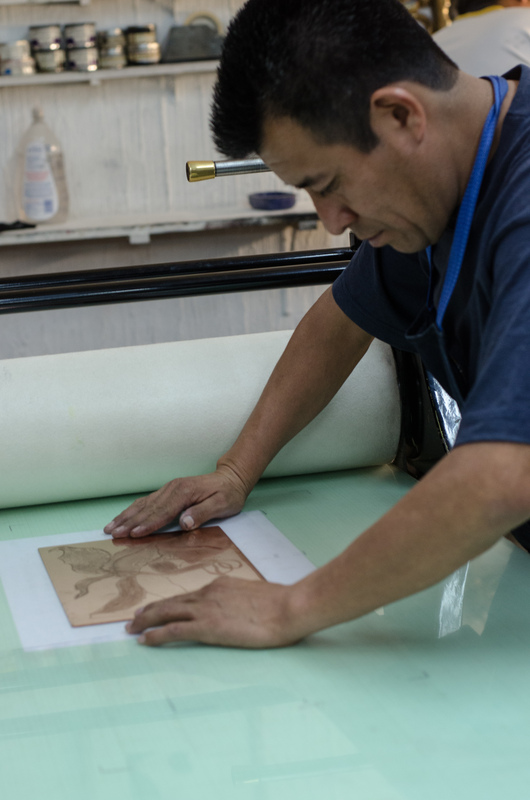 What captured by attention through the open window was a man working at a traditional printing press, turning the wheel by hand. The light was beautiful. This was a great photo, I thought, and stuck my lens through the metal bars. Then, with the motion of his hand, he invited me in. Here I was in a world of art being created before my eyes. It was a delight and surprise. 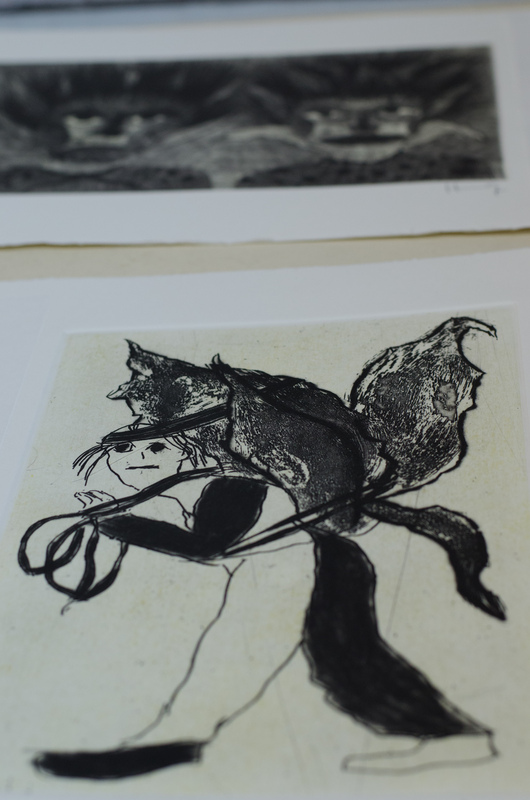 The techniques they are using here are well-known in the art world: aquatint, dry point, serigraph, sugar lift, and wood cut. (In Spanish: punta seca, aguatinta, serigraphia, agua fuerte.) 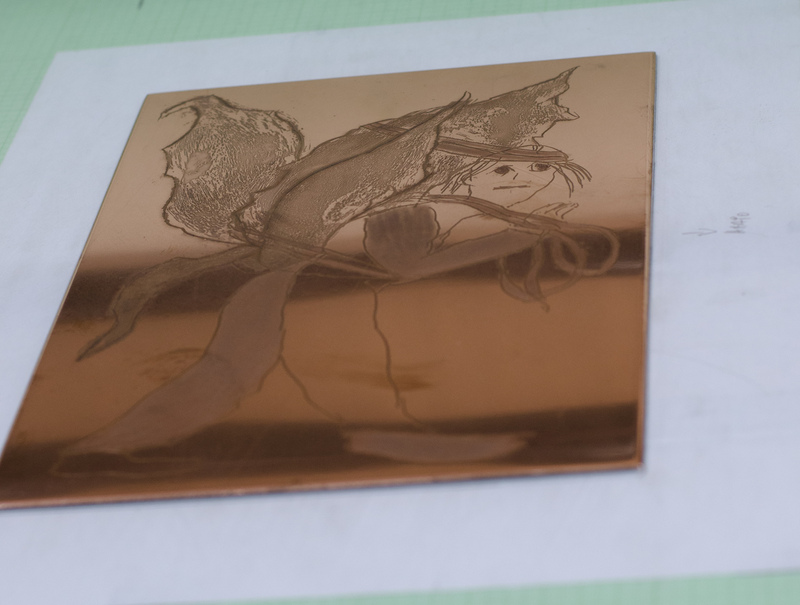 The artist creates his/her image on copper or zinc plates, on acrylic sheets or on wood. 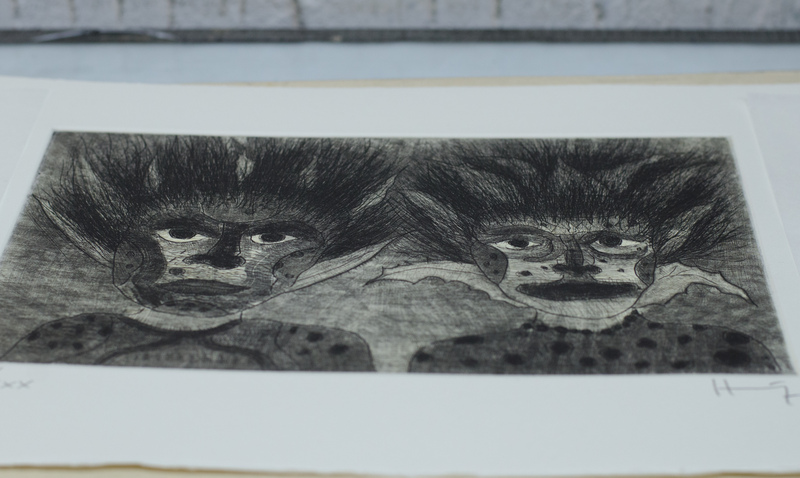 The printer then transforms these etchings onto paper, with the help of an acid bath, varnish and rosin. 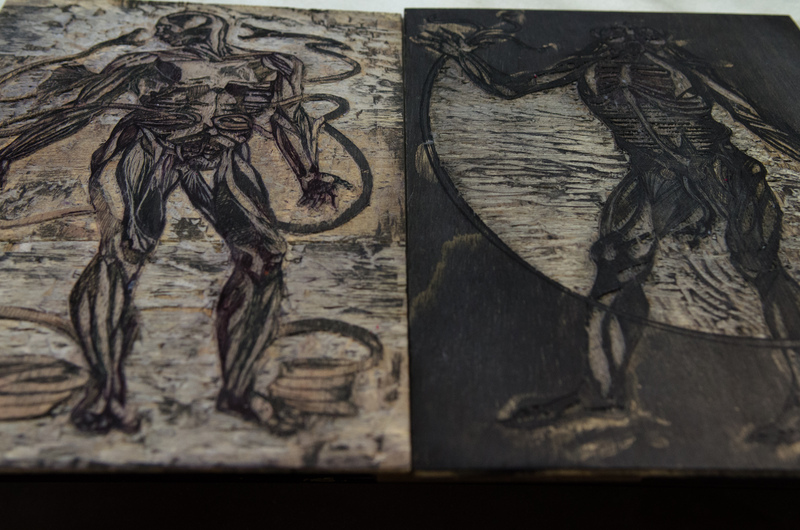 The strength of the etched image is based on the time in the acid bath. 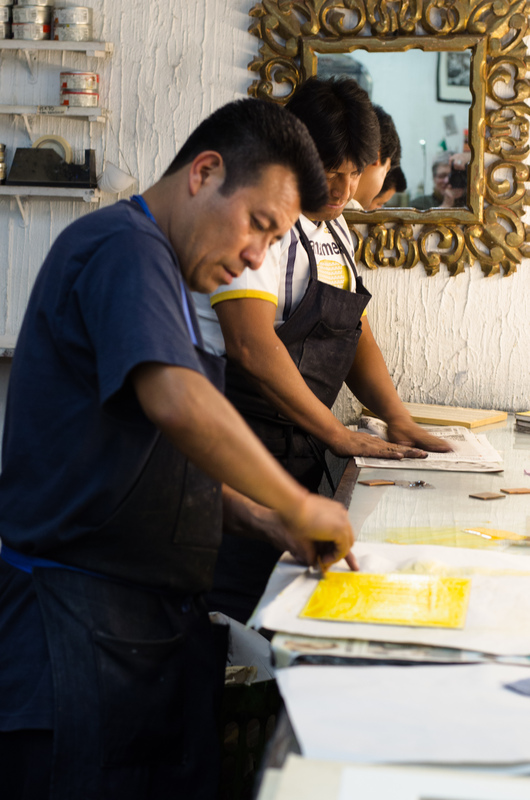 To make a four-color print, the image requires four plates, one each of yellow, green, red, and brown. 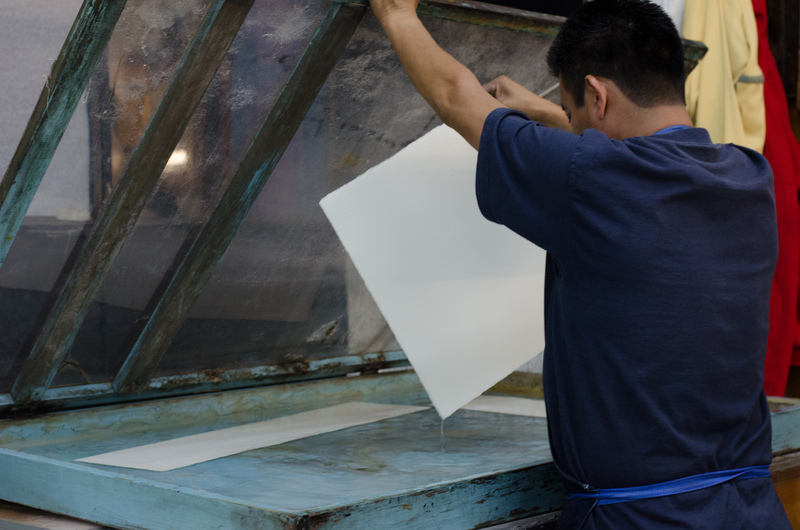 The overlay of color produces a wider color range, planned in advance by the artist. 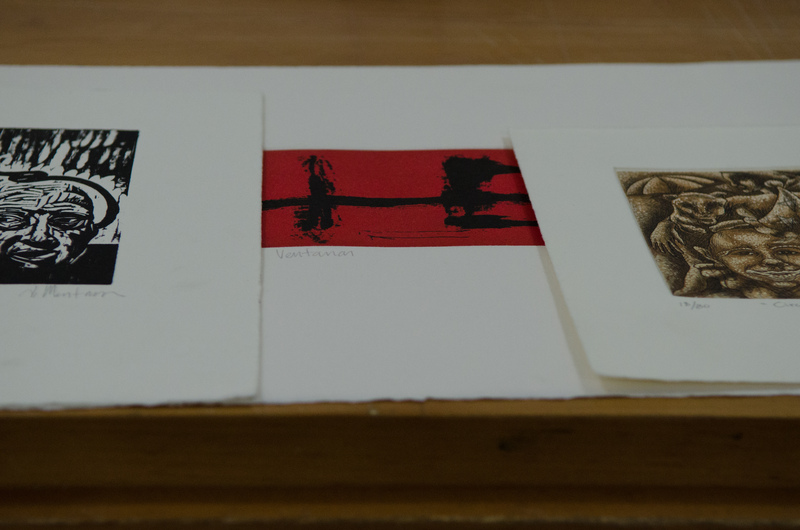 The series of works made in the studio are numbered and signed, usually in editions of no more than 50 prints. 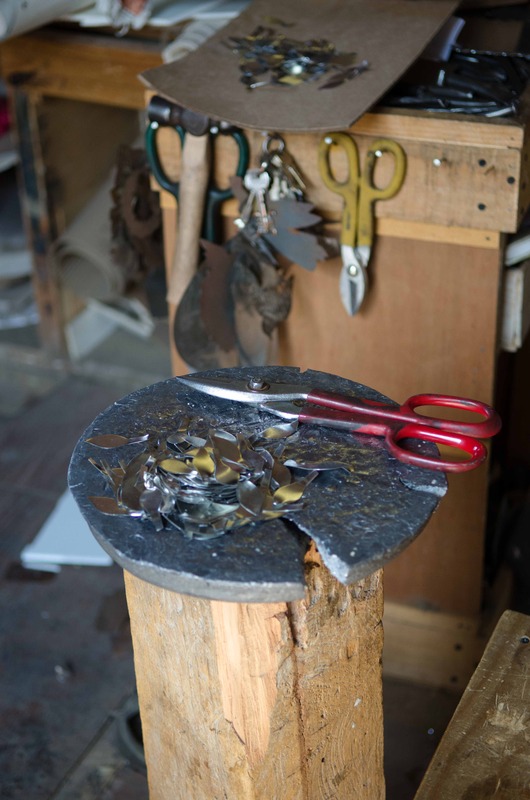 Then, the plates are typically destroyed. 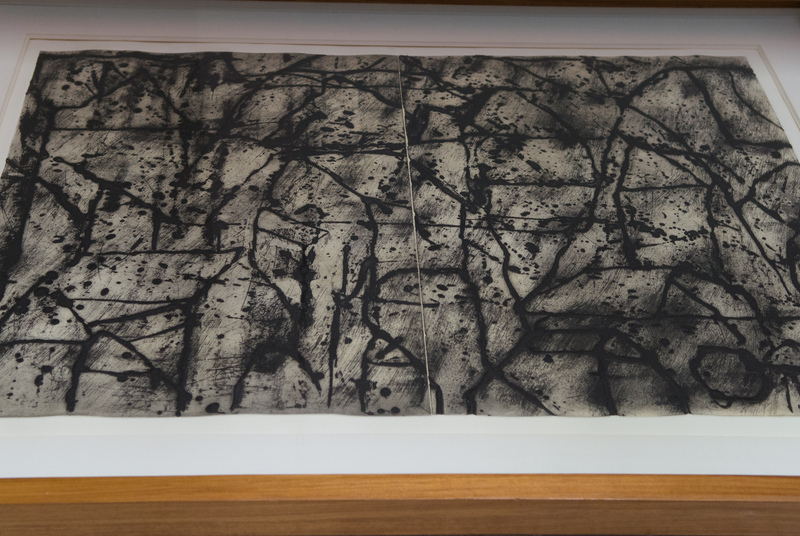 When I noticed a pile of crumbled prints under the press, I asked what they were. Color tests, Jesus, who speaks a little English, replied. 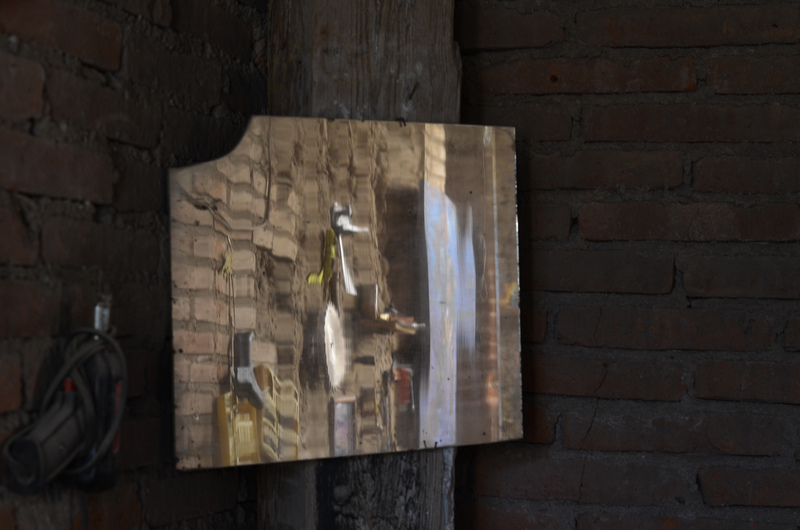 Then, it occurred to me that they might also have a gallery here, too, where the work is offered for sale. And, indeed, it is. 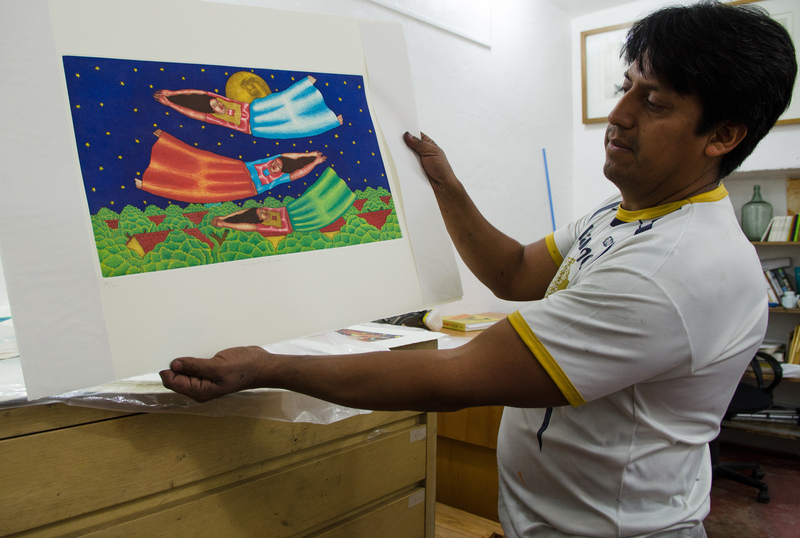 Jesus led me into a well-lit room away from the printing area where flat drawers were filled by beautiful pieces and the walls were covered in framed prints. 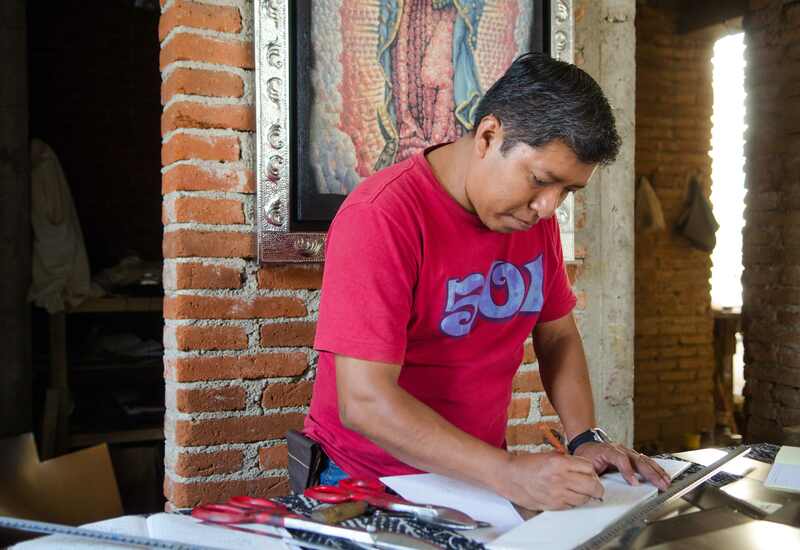 The artists represented are Sergio Hernandez, Fernando Olivera, Fernando Sandoval, Eddie Martinez, and Ohioan Charlie Barth who also works in Oaxaca. 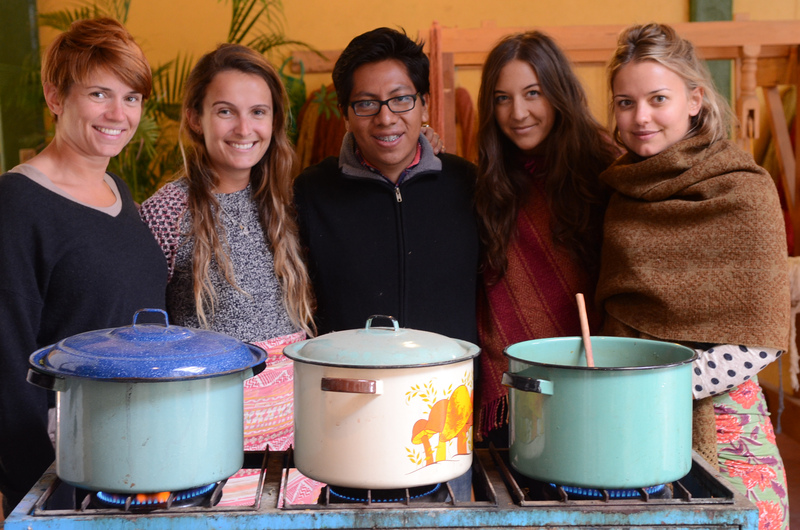 Prices range from about 1,500 pesos to 6,000 pesos. I’ve got my eye on one or two of these! Perhaps someday …. 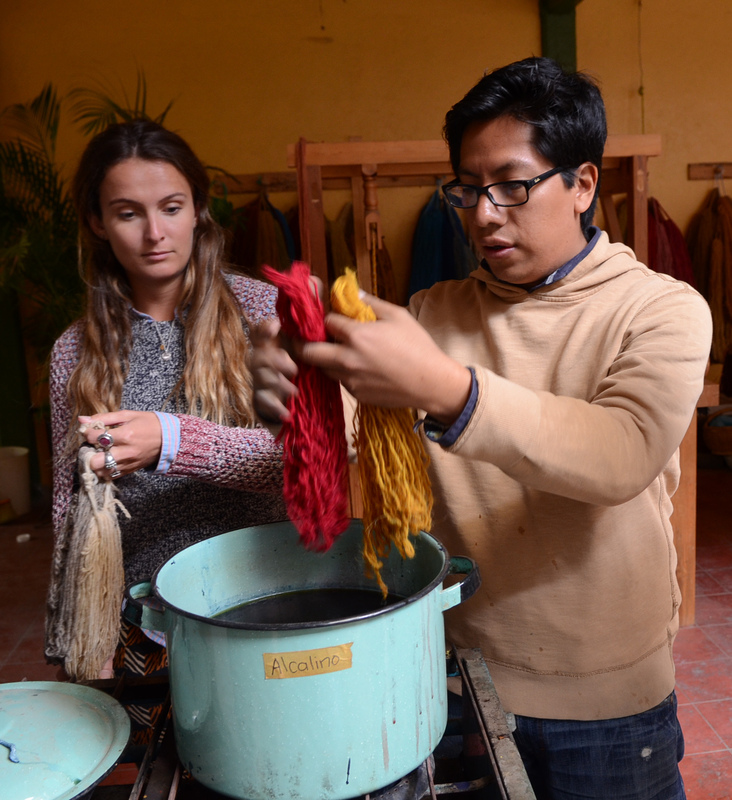 If you are looking for hands-on instruction, a cultural immersion into natural dyes of Oaxaca, and would love to have an experience learning from the Museo Textil de Oaxaca’s director of education Eric Chavez Santiago, please contact me. 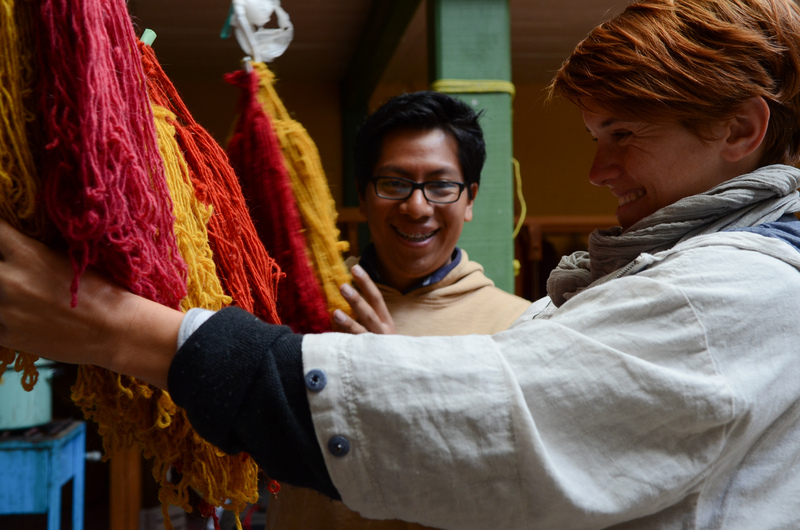 We organize programs for museums, textile guilds, fiber artists, designers and anyone wanting to know more about hand-dyeing with natural materials. 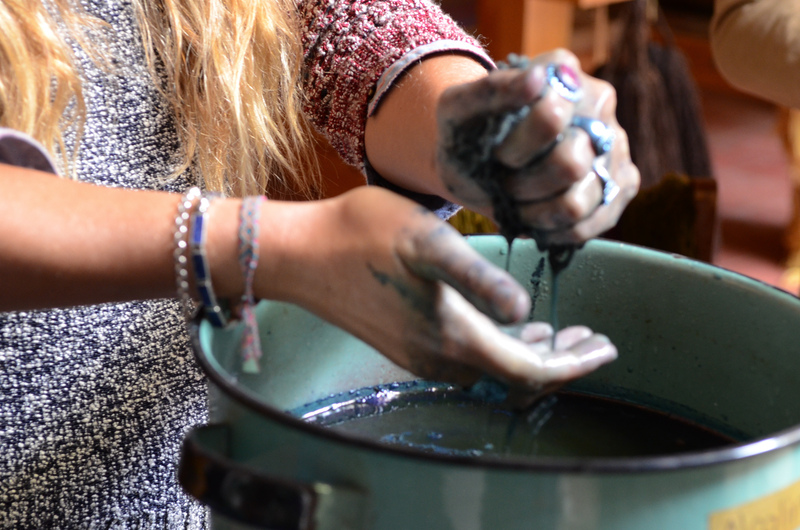 Royals around the world coveted indigo as a symbol of their wealth, power and prestige. 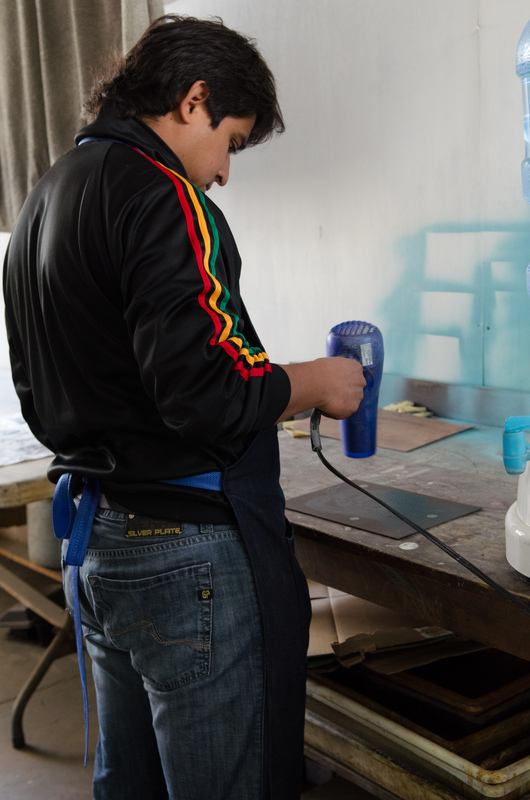 When we think of the color royal blue, what comes to mind is an intense, deep color that saturates the fabric and draws attention to the person wearing it. Indigo was used 6,000 years ago in Egypt, sought after by the Pharaohs who procured it from traders who traveled the tropical belt of Africa. Indigo is mystical, says Eric. In Africa, dancers pray for an abundant indigo harvest to give them an abundant life. 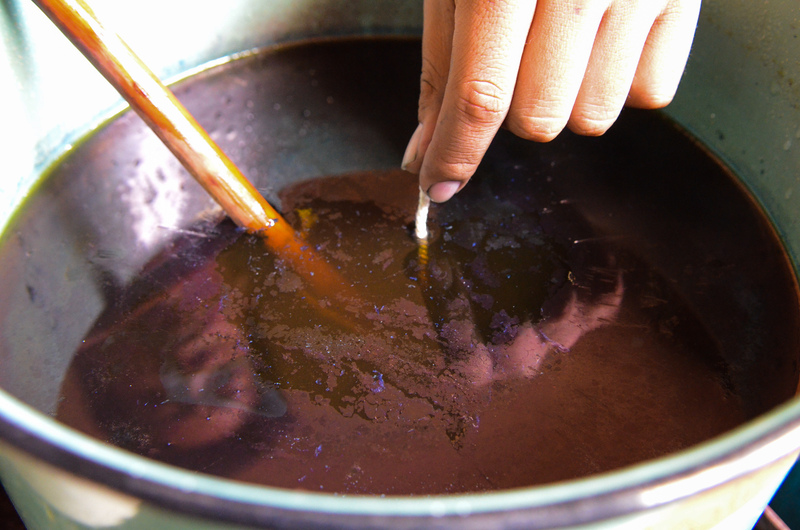 In Puebla, Mexico, there is a traditional story that warns pregnant women not to approach an indigo dye bath. If they do, the power of the color will disappear. 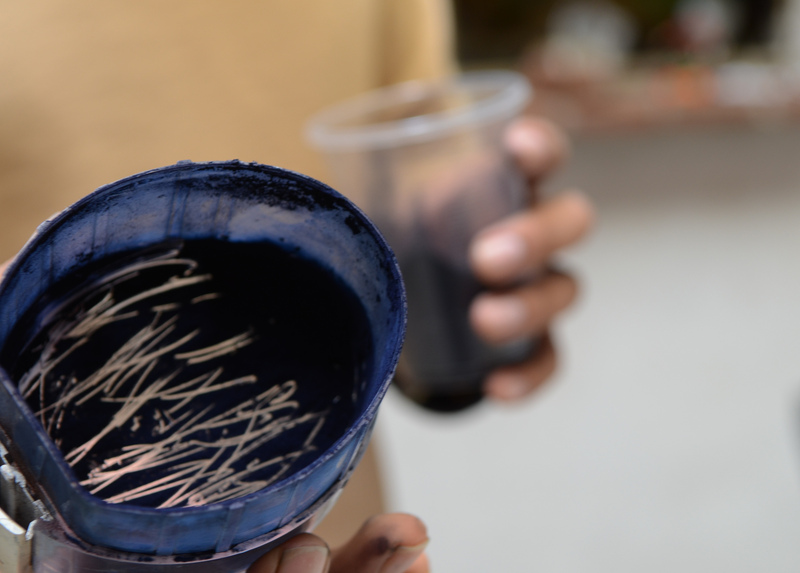 But indigo is a chemical process, says Eric, straightforward and scientific. 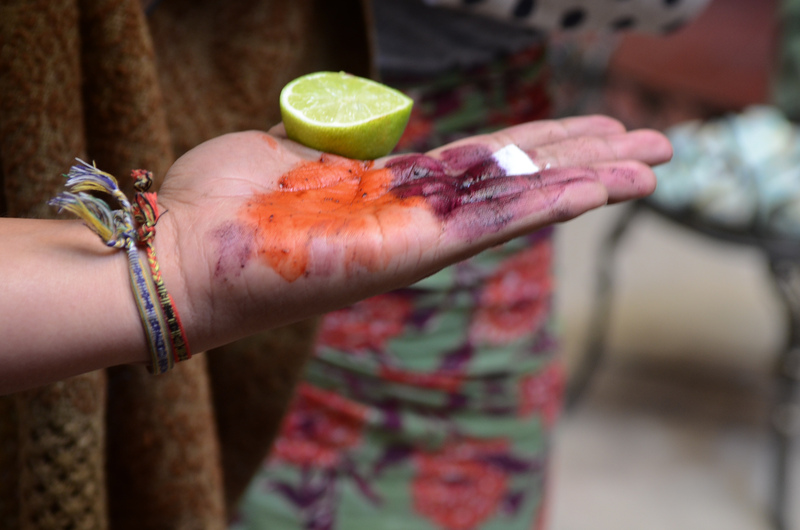 Today from Oaxaca, Mexico, to Africa, to India, to El Salvador, to South Carolina, USA, over 40 different indigo plant species, some of them wild and native to each region, are cultivated for dye material, explains Eric. 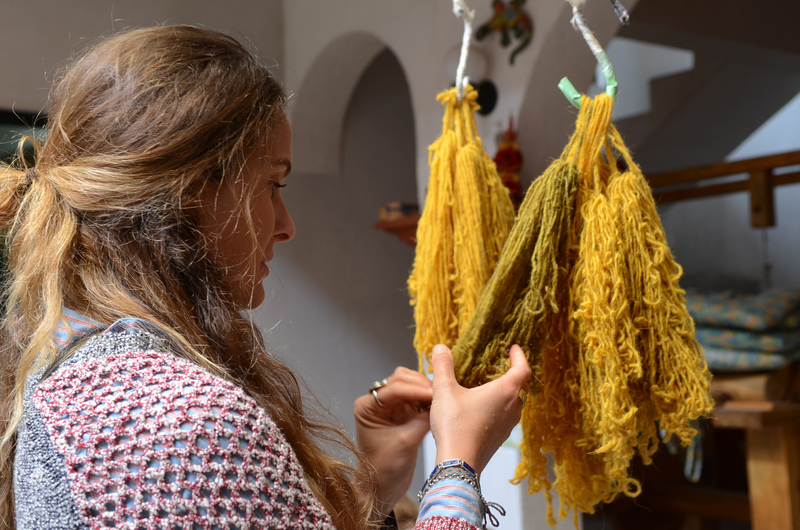 In Oaxaca state, the wild bush grows along the Pacific coast, is cultivated, fermented, dried into blocks, and sold to weavers and dyers, who grind it into a fine powder for use on protein fibers such as wool and silk, or on plant fibers such as cotton. 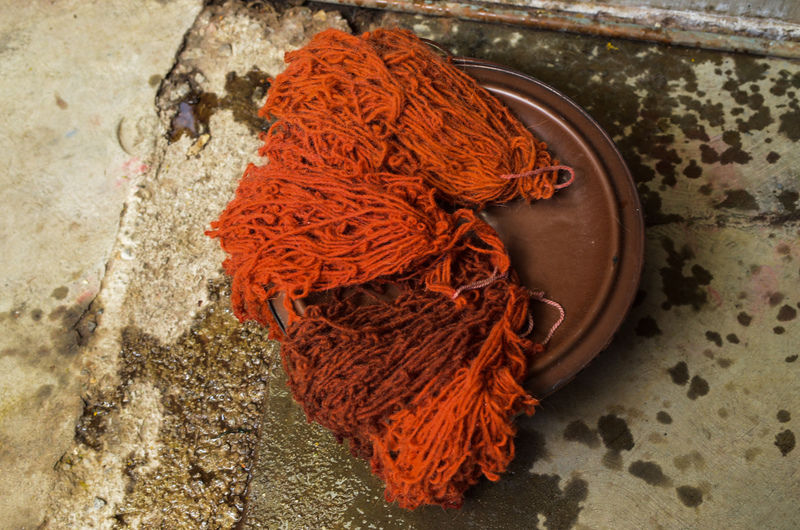 Our workshop focuses only on dyeing wool, since cotton takes much longer. 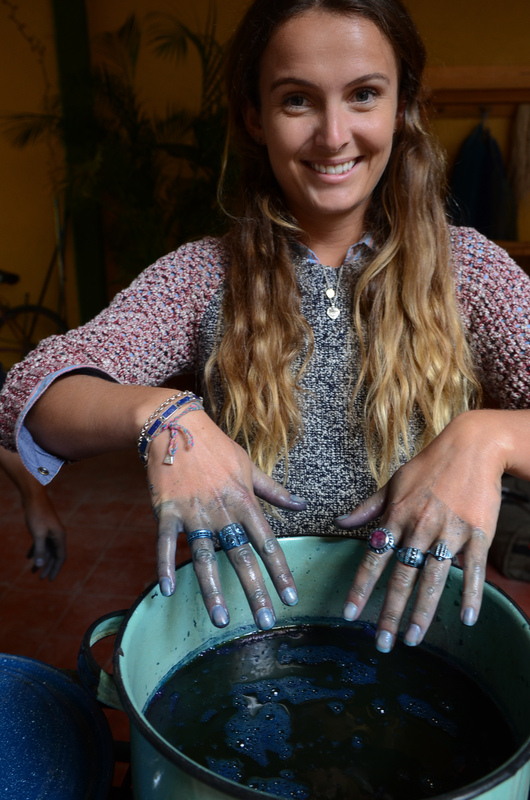 This year, in 2012, Oaxaca had the largest harvest of indigo ever. Over 400 pounds of dried leaves were picked. 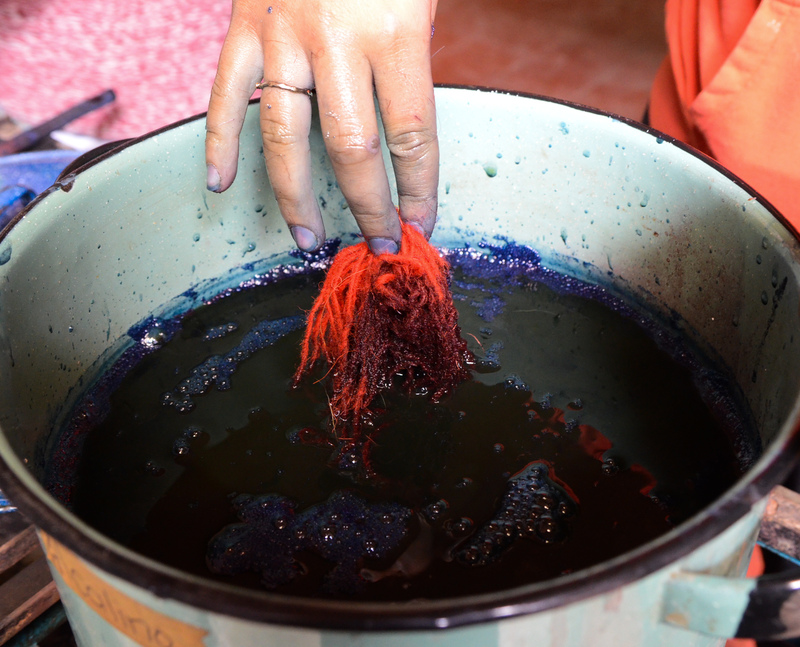 Oaxaca’s indigo produces one of the most powerful, intense colors in the world, along with the indigo of San Salvador. The color from India and Africa pale in comparison. 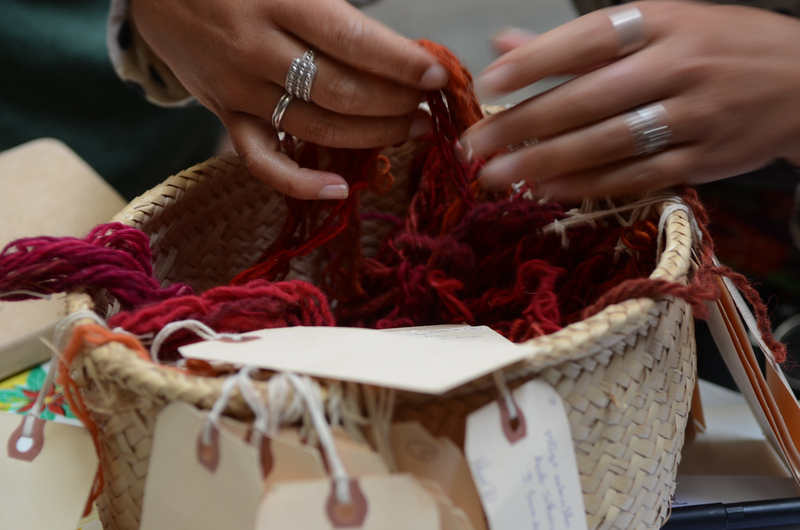 This is good for local weavers who are turning to the use of indigo for its color-fast results and organic properties that ensure environmental sustainability. 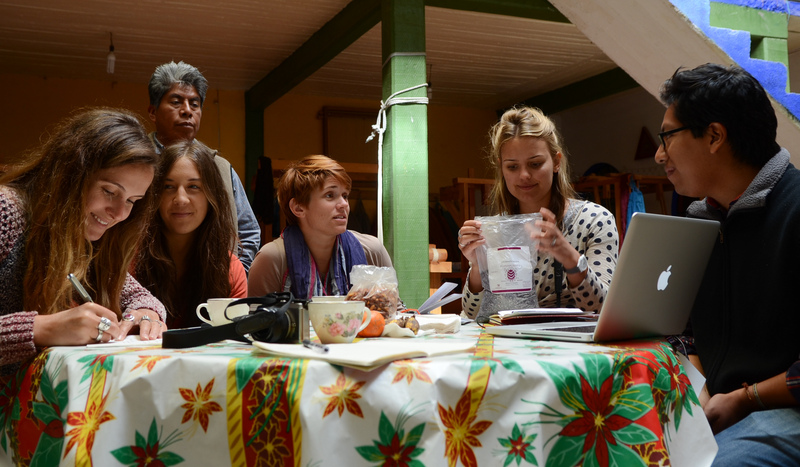 During this second day, we used an indigo recipe developed by French chemist-dyer Michel Garcia. 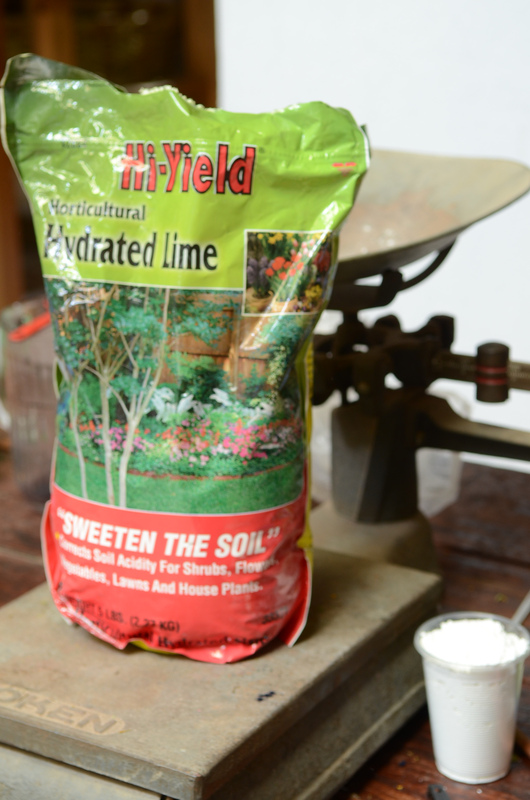 Eric has studied with Michel Garcia and uses his fructose-based recipe along with hydrogenated lime. 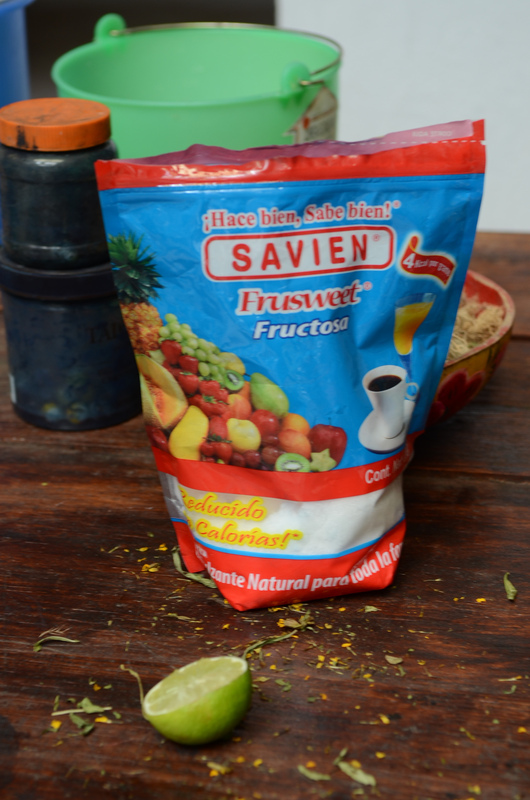 The fructose reduces the oxygen in the water, stabilizes the water, and suspends the indigo to yield a more uniform, intense color. 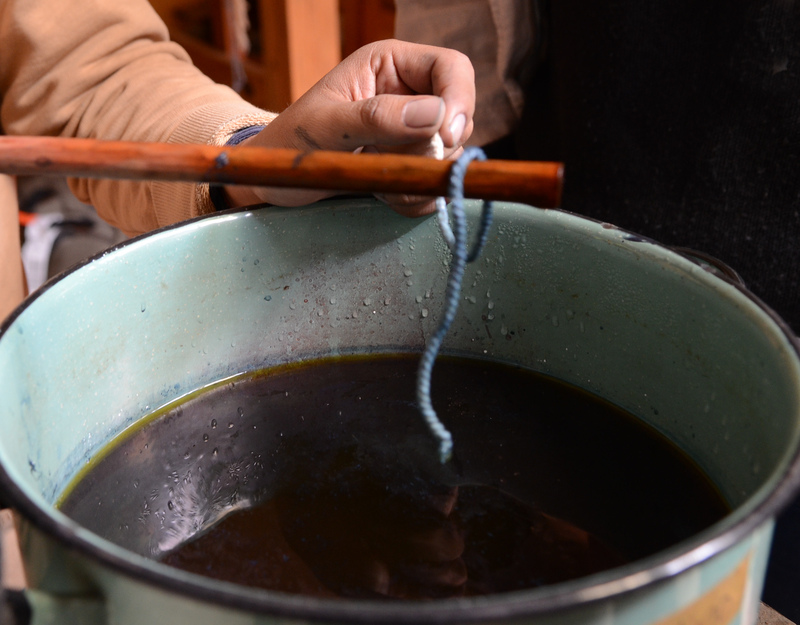 One only needs to stir gently with a wooden stick or fingers! 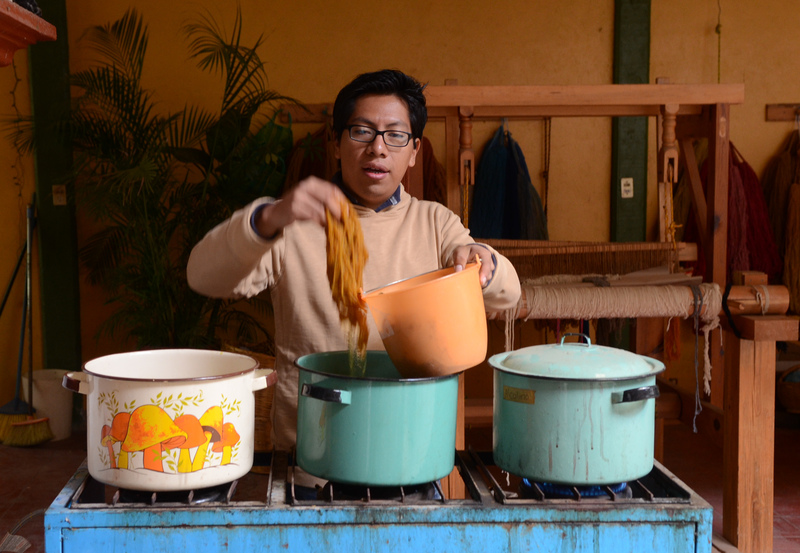 To pulverize the rock-hard indigo, ancient dyers used a metate and mano de metate. 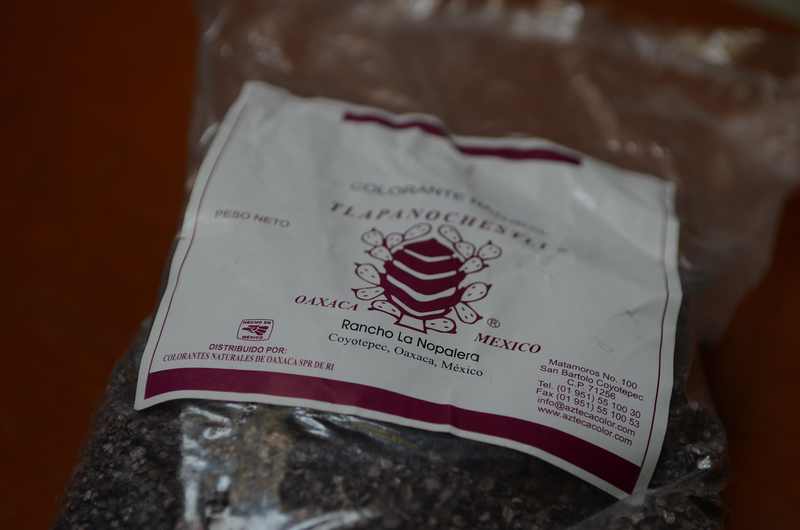 Today, Eric uses a coffee grinder — one for blue indigo, another for red cochineal. 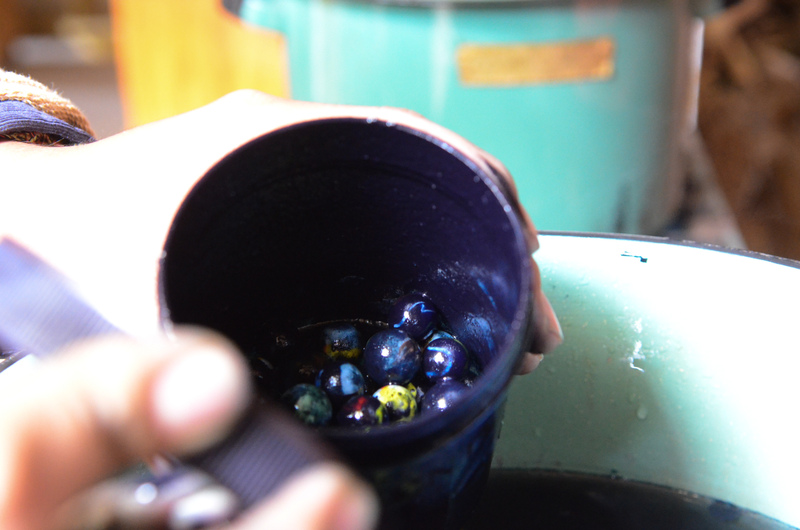 He dissolves a bit of the indigo in a small sealed jar of water filled with marbles, and shakes it well. 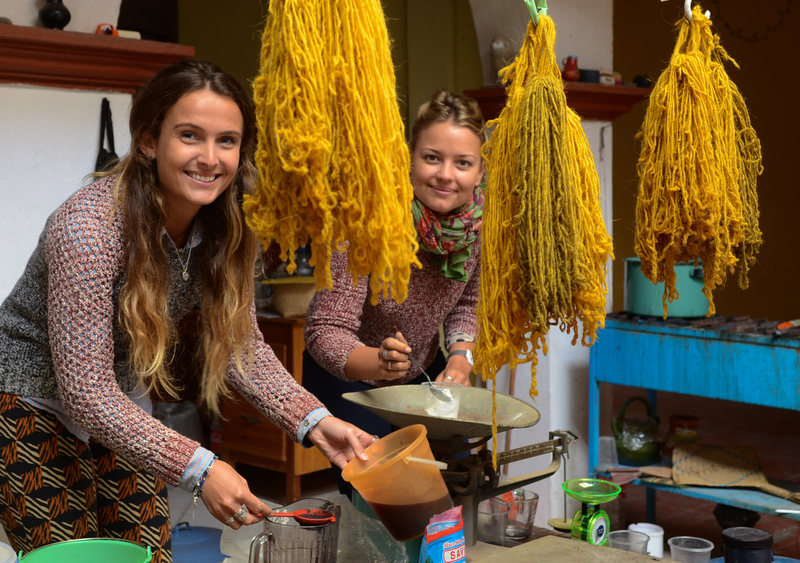 There are many indigo dye recipes available on the Internet along with recommendations for making dye baths, so we are not going into that here. 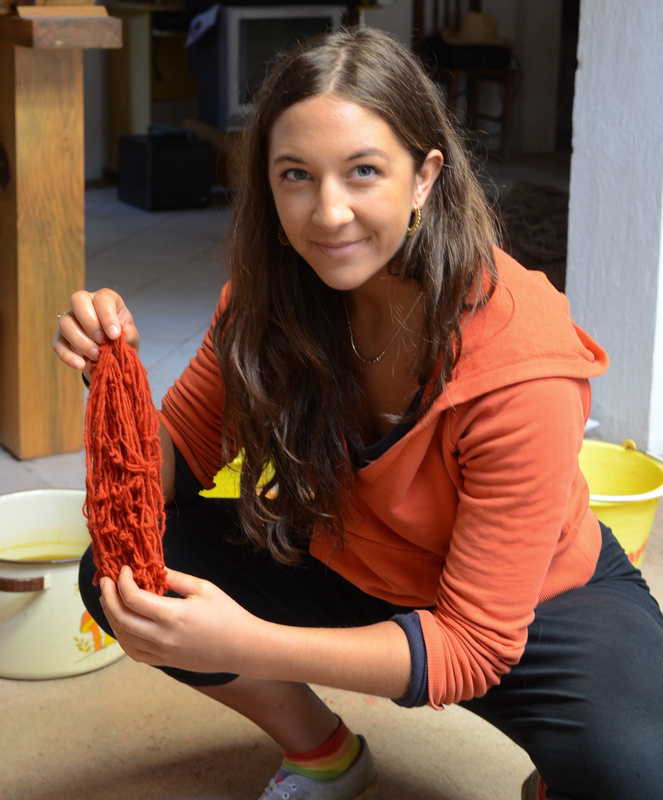 During the two days, we dyed a range of primary reds and yellows using cochineal and pericone. 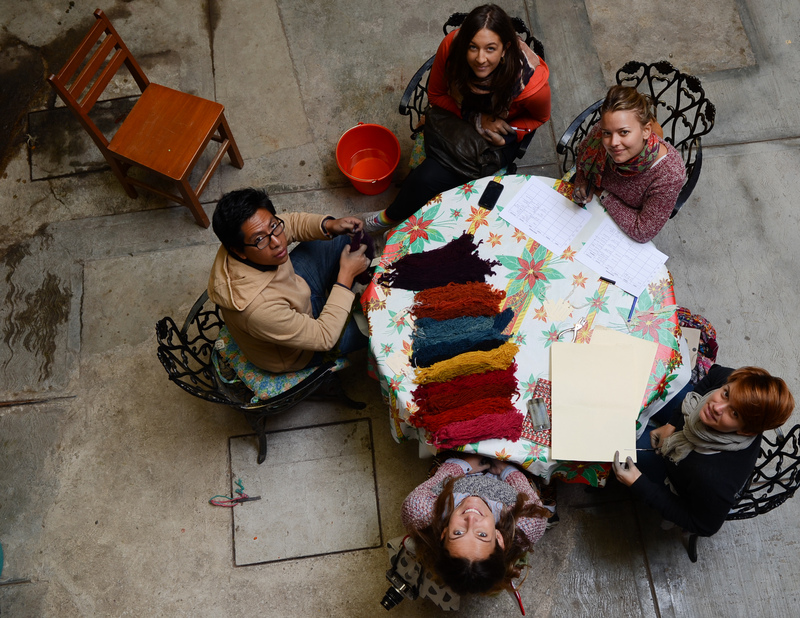 On day two, over dyeing these colors with indigo, we were able to make a broader range of greens, oranges, browns and blacks. 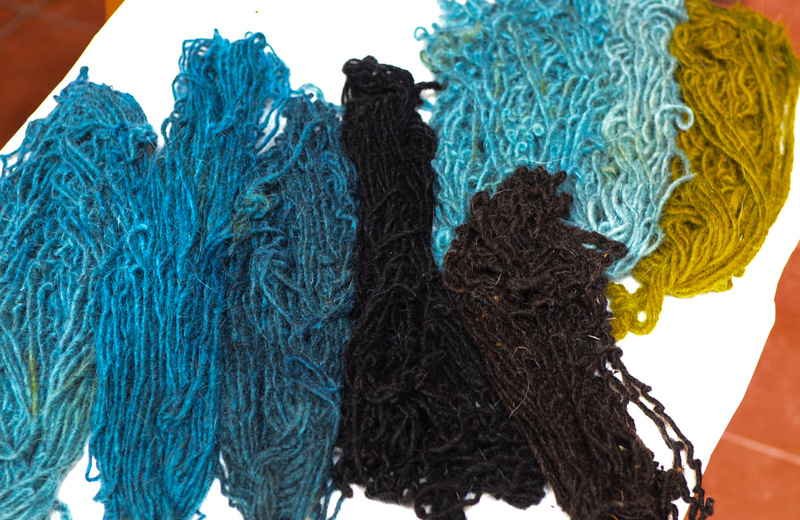 All in all, the two days resulted in over 20 stunning colors — all color-fast, durable and natural. 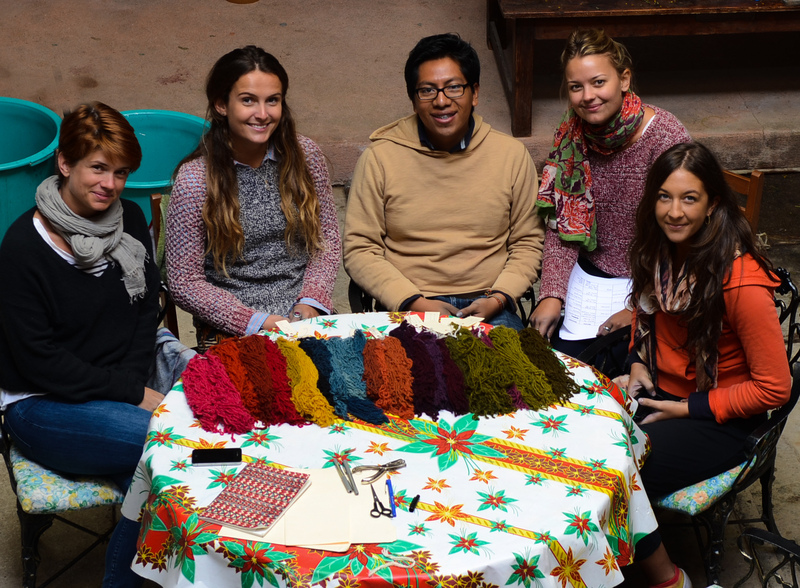 We are happy to organize customized workshops and plan a series of open-to-anyone-interested two-day workshops starting this summer, just like we did for Walter G & Company principals Lauren Bennett and Genevieve Fennel with friends Lara Zilibowitz and Tempe McMinn.